Bunny, a magnificent horse, and two brothers, Bud and Tom, ship out to Europe in 1914 among a group of police horses and officers sent to fight on the battlefields of WWI. Bunny is initially assigned to Bud, and when he is killed he becomes Tom’s horse. The two form a close bond, and survive the conflict together, performing acts of heroism and sacrifice along the way. At war’s end, however, the two are separated; Tom returns to Canada, and Bunny is sold to a Flemish farmer. McLeod tells Bunny’s story with a combination of poetic license and narrative restraint. Her straightforward prose tells Bunny’s story simply, without drama or sentiment. We experience the hardships of war–the hunger and danger and death–but the matter-of-fact tone with which they are expressed establishes Bunny’s and Tom’s resolute, impenetrable bravery. Lafrance’s folk-like illustrations reinforce this sense of plain strength. Spread across double pages, the images are a bleak amalgam of murky greens and greys, setting a desperate tone broken only by the brilliant poppies immortalized in Dr. John McCrae’s poem “In Flanders Fields.” McLeod includes an author’s note in which she explains just how much isn’t known about Bunny’s story (even “Bud,” the name given Tom’s brother, is an invention), and confirms the heartbreaking conclusion. The Library and Archives Canada Cataloguing in Publication assigns fiction subject headings to this title, and I’m inclined to agree. This is a fiction with roots in fact. But it is no less a powerful and touching evocation of the perpetual price of waging war. In stark contrast to Bunny, Stubby the War Dog is a presentation of a bodacious collection of scrupulously documented facts surrounding one formidable dog. Sergeant Stubby, as he was known, was a dog with a personality as outsized as his antics. He presented himself as a stray to the 102nd Infantry, training at Yale University in 1917, and so endeared himself to the soldiers that one Corporal Robert Conroy smuggled him onto their ship bound for the theater in Europe. From there Stubby’s infamy grew and grew. Bausum offers a series of almost unbelievable anecdotes–Stubby saluting the officer who discovers him as a stowaway, Stubby rescuing a French toddler from oncoming traffic, Stubby recovering from grievous injury sustained on the battlefield–which establish his irrepressible persona. She also surrounds Stubby’s own story with rich and extensive context, offering lots of information about the greater war and its impact on everyone it touched. The narrative follows Stubby back to the United States after the war, where he travels, parades, and generally contributes to the post-war effort, and even chronicles his story after death, and the eventual inclusion of his remains at the Smithsonian Institution. What is most striking about this masterful exposition, to me, is the journalistic integrity of Bausum’s language. She makes it crystal clear, at every juncture, what she knows and what she wonders, and how she knows the difference. At no time does the reader question the veracity of the facts being presented, yet the narrative’s careful precision never intrudes on the accessible flow of the story. It’s easy to imagine kids enthralled with Stubby’s bigger-than-life life. And it’s just as easy to imagine them fascinated by the curiosity that prompted the investigation and the research that followed. I consumed the story through the Recorded Books audiobook version, narrated by Andrea Gallo, and even the experience without a single image was riveting. These two books differ from one another in interesting ways. One uses snippets of history as a foundation for a largely fictionalized story while the other offers a detailed account sourced from the (admittedly much more plentiful) historical record. Yet, almost counterintuitively, it is Stubby’s “true” story that brims with outlandish, colorful flourishes, while Bunny’s “imagined” account offers a much more reserved and stoic vision of the animals-at-war experience. And this juxtaposition, in a nutshell, is what I love so much about the work of librarianship for the young. 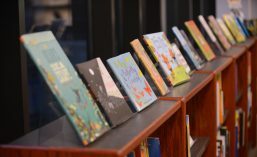 It is not ours to determine which is the better, truer, more legitimate approach, We get to put these books on the self, together, and invite kids (metaphorically, or directly, too, if we want) to ponder them both. As 2014 ALA Annual approaches I find myself, as ever, catching up with the award-winning books of the year, in anticipation of the upcoming conference’s many festivities. I just finished listening to the affecting recording of Newbery Honor-winning Paperboy by Vince Vawter, a semi-autobiographical story of a boy with a stutter coming of age in Memphis, TN in 1959. The entire novel takes place over the course of a few weeks in the summer before 7th grade. Our protagonist, whom we come to know as Vince at the end of the book, takes over his friend Rat’s paper route and though his interactions with the people he meets as a consequence learns about himself and his place in the world. I will leave the details to you (if you’ve read the book you already know them, and if you haven’t, I don’t want to spoil them) but I do want to look at a pivotal scene where Vince and his guardian find themselves in grave peril, due, to some degree, to Vince’s disobedience. There is risk of real bodily harm, death even, and yet in the moment of danger there is no guilt and no reproach, only devotion and commitment. I credit the author for his keen characterization and careful plotting. He telegraphs none of these feelings, focusing instead on the circumstances and allowing the emotions to course underneath, organically. It’s a beautiful piece of writing, successful for its simple clarity and for the well-crafted build-up before it. The scene has been much with me of late. Beyond its own literary resonance, it speaks to my understanding of the news of the day, specifically the aggressive scrutiny of prisoner of war Sgt. Bowe Bergdahl negotiated release. There are some who proclaim Sgt. Bergdahl a deserter who besmirched his homeland’s good name. They see his exchange for five Guantanamo-detained members of the Taliban as an abominable expense of geopolitical capital. They call him a traitor and thereby invalidate any claim he might have for American support. But my recent experience with Paperboy reminds me that our relationships have value expressly because they are not dependent upon our perfect behavior. We are allowed mistakes. Those who love us and assume responsibility for us take care of us. No matter what. I would hope that a soldier putting himself or herself in harm’s way could expect no less of his or her government, regardless of whether or not that soldier had stepped afoul of the line. I imagine that the circumstances surrounding Sgt. Berghadl’s initial disappearance will be investigated, and that strikes me as wholly appropriate. But I’m thankful and proud that the United States Government negotiated his release based upon his citizenship, not his conduct. We all make mistakes, and none of us would want to be defined by our worst ones. Life is so very complicated, and how lucky we are that we have fine books like Paperboy to help us make sense of it. News is emerging that actor Tim Curry is recovering from a stroke. Initial reports suggested that he had collapsed yesterday following a massive episode. More recent reports say that, while he collapsed in his LA home yesterday, the stroke occurred last July, and he has been recovering (well) ever since. In any event, I wish him very well. 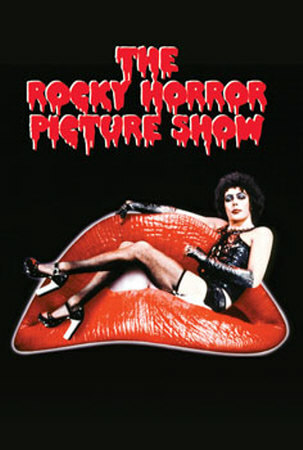 When I was in High School I went to midnight showings of the Rocky Horror Picture Show week after week (after week) at the Coventry Cinema in Cleveland Heights. I think its fair to say that the experience had a profound effect on my adolescence, offering an indelible, albeit particular, affirmation of different ways of being. Watching and eventually joining the participatory irreverence, throwing toast, spritzing rain, singing and dancing along, offered me a kind of community I really needed at the time. Who knew musical theater could be like that?! Speaking of musical theater, I refuse to apologize for the fact that I love all things Annie. I just do. Ask me about Kristen Vigard’s casting as the original red-mopped orphan and her replacement with Andrea McArdle after previews in Conecticutt. Heck, watch the Julie Stevens documentary, Life After Tomorrow (SJP!) if you want to know more about it. 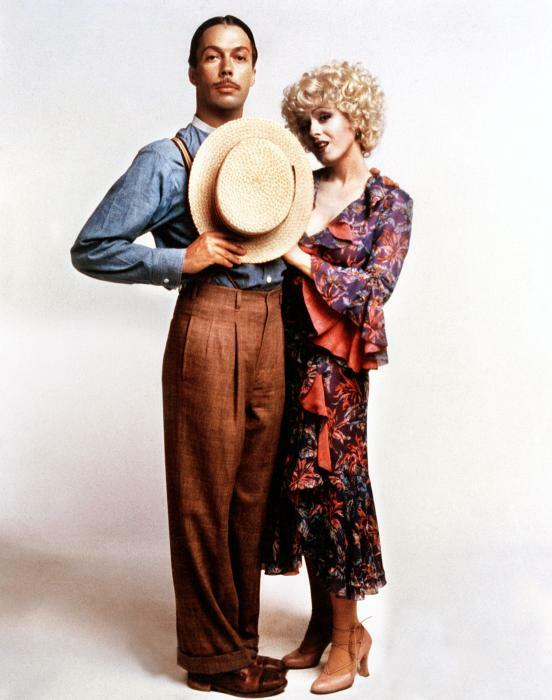 Anyhow, Curry plays Rooster in the 1982 movie version. There’s lots to love about the film, if you’re me, at least, including his sneaky, sinister performance. He’s brilliant. And, thinking back, it’s a little striking how much Carol Burnett, as Miss Hannigam. looks like Frank N. Furter. Huh. But today I remember Tim Curry as an extraordinary narrator of audiobooks. My introduction to audiobooks came with my very first ALSC evaluation committee experience as a member of Notable Recordings for Children. Back then each of us was assigned a sampling of eligible recordings (cassette tapes! ), based on the first letter of the title. I was assigned A-C, and received, relatively early in the year, the first of Lemony Snicket’s Series of Unfortunate Events, The Bad Beginning. So charming. Curry’s arch, over-the-top narration makes the most of the tongue-in-cheek prose, honoring its playful irony and milking the humor. It’s just a little irresistible. But my favorite audiobook performance of all time must be his stunning readings of Garth Nix’s Abhorsen trilogy. It was such an interesting choice, casting a man to read these menacing novels about a family of necromancers in a centuries-old battle against conspiring evil, as all of the protagonists are young women. But once you hear Curry’s contemptuous reading of Mogget the familiar, and the positively dripping malevolence of Orannis, the baddest of the many baddies, you know the choice was just perfect. I have listened to all three, in sequence, at least five times, stem to stern, and they never disappoint. I recommend them all the time, and do so again today, to you. So, here’s wishing Tim Curry a continued speedy recovery, with hopes that he finds his way back to the recording booth soon.